Evelyn Robertson (nee Mary Evelyn Roberts) was a McKinney native who spent 16 months during WWII with her husband exploring South America for the Cincinnati Museum of Natural History. She and her husband moved to Dallas where she owned and managed an oil company. 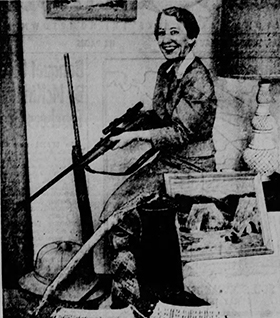 Evelyn (Roberts) Robertson was a McKinney native who spent 16 months during WWII with her husband exploring South America for the Cincinnati Museum of Natural History. She and her husband moved to Dallas where she owned and managed an oil company. Evelyn Robertson was a female Indiana Jones who spent her life exploring the world and pushing the frontiers of woman’s freedoms. Born in 1915 to Roy and Emma Roberts of McKinney, Texas and graduated from Texas Women’s University in Denton. In the late 30’s she lived in Beverly Hills, California with her husband Leroy Robertson who worked for National Cash Register. However, in 1941 she and her husband began a 16 month exploration of South America for the Cincinnati Museum of Natural History in search of the “white Indians” of British Guiana. This secluded tribe was thought to be the descendents of Christopher Columbus’ crew who jumped ship near Trinidad. During their trek through British Guiana, Venezuela, and Brazil they ventured into regions never visited by Westerners. They were cut off from contact with the outside world for months at a time and did not know that the U.S. had entered World War II until July of 1942. Their encounter with the tribes they went to observe was cut short out of concerns for their own safety. The “white Indians” proved to be hostile not just to Westerners but even to other South American tribes and were suspected of cannibalism. Upon their return 1943, Evelyn’s husband addressed the Explorers Club of New York and the American Geographical Society of New York. Their discoveries made it necessary to change the maps of South America. They also returned with hundred’s of bird specimens that are now belong to the Cincinnati Museum. Evelyn and Leroy show some of their adventure on film and made numerous public presentations through film lectures. On March 17 & 18, 1943 their film presentation preceded the showing of “The Avengers” and “No Place for a Lady” at the Ritz Theater on the McKinney square. After the interest in their trip settled down, Leroy and Evelyn saw opportunity in the car business as servicemen began returning home. The two went into business with Evelyn’s her brother Roy Geldon Roberts and opened a Frazier & Kaiser car dealership at 213 N. Tennessee Street, the current site of the Local Yocal. While living in McKinney the couple resided at 503 Tucker Street. Around 1948, Evelyn and Leroy left the automobile business and McKinney to settle in Dallas where they started the L.R. Robertson Oil Company. In 1953 Leroy was killed when a National Airlines DC-6 passenger plane crash in the Gulf of Mexico near Mobile, Alabama. Evelyn became the company president and headed the company until her death in 1964. Though Evelyn launched no more expeditions following Leroy’s death, she did spend time traveling Europe and Africa and lived for a while at Jerez de la Frontera, Spain. She remained a member of the Royal Geographic Society and enjoyed playing the organ, painting, and photography. Her business interests extended beyond the companies she owned and served as a financial advisor to many.